About three years ago we were given some mystery seeds by a friend. They were from a “dark green plant with blue crepe paper looking blooms”. I planted them in a corner of the garden next to our garage. 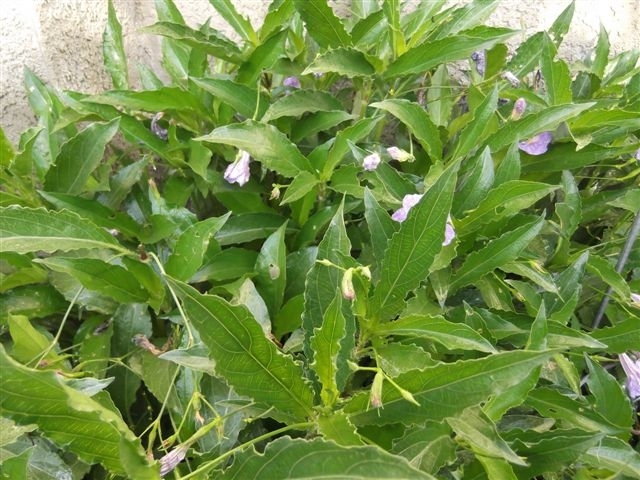 Within a relatively short period of time, we had a dark green serrated leaf plant that eventually bloomed with bright blue tubular flowers. It froze back in the winter reappearing in the spring. AND it spread but we found it was easy to pull out the miniature self-seeded plants. I tried to identify this plant without any luck. Sunset Western Garden Book was read from cover to cover, I asked other gardeners who toured our garden and basically had given up the quest. Then last week during a tour at High Hand Nursery in Loomis with the Vaca Valley Garden Club, I spotted our plant. 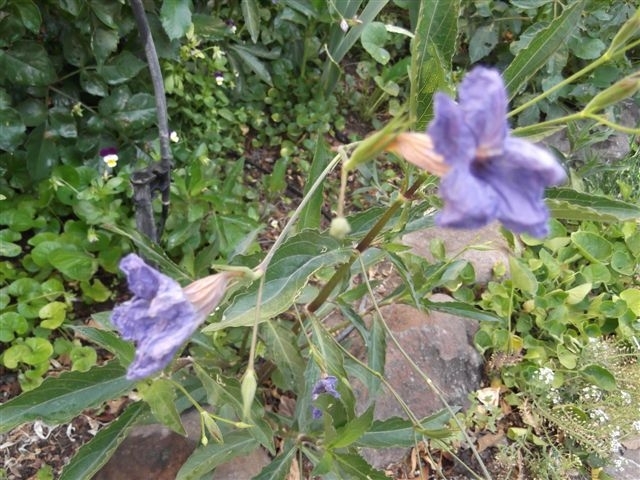 It is a ‘Ruellia brittoncana’ or Mexican petunia. Finally the mystery plant was identified and had a name. In doing some research, this plant is native to Mexico and easy to grow in dry or wet soil conditions. They are perennial shrubs that grow about 3 feet tall and 4 feet wide. There are some dwarf varieties available such as 'Katie', which grows to 10 inches in height. With little care these plants produce flowers in white, purple or many shades of blue. They resemble the petunia flower we are familiar with, but the two plants are NOT related. Butterflies and hummingbirds are attracted to the colorful blooms, which makes the plants popular with backyard gardeners. Gardeners either love Ruellia or dislike it due to its invasive nature. There is a sterile version that will not re-seed called 'Purple Showers'; the flowers are deep purple. Though it will not re-seed, it can spread by its roots if grown in wet soil. Sometimes called desert petunias, the more sun they receive the more blooms they produce. You can propagate Mexican petunias by cuttings, seeds or division. Plant in the early spring and once established you will have blooms throughout the summer into fall. 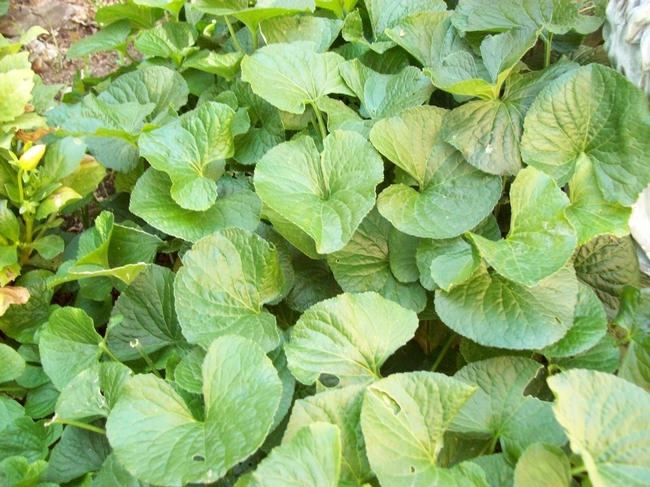 The plant is hardy enough to survive long periods without water, although young plants need regular watering. They adapt easily and grow well in containers, provided they receive sun. And the best news is Ruellia brittoncana is highly resistant to most disease and pests. Do you remember when you were a child and you had to help in your mother’s garden. I do and it seems she always had a plant that you loved maybe because of the color or shape of the flower and thought when I have “my own place” I will have that plant. Sad to say I did just that, the plant I choose that my mother had growing in a container. I always wondered why when her others were growing in the soil, but as a child I never asked. But years later I found out why when mine out grew the container I had it in and violets started showing up all over my yard. Maybe the only nice thing I can say about this violet is it blooms late winter, early spring with just the flowers and no leaves when most things are still dormant. After the violet colored flowers fade, the heart-shaped leaves start to appear and stay and multiply and grow larger each day until late fall early winter when they die back, only to return the next winter with many more. These violet are all over my yard, sun or shade-makes no difference to them they will grow and multiply. You pull them out thinking you have got all parts of the rhizome, only to turn your back and they are back again! This plant has to be on the most invasive plant list; maybe even in the top group, if not I am going to start a campaign to have it added. Maybe the only way I can get rid of them is to move, but knowing how much of pest they are they probably will find a way to follow me. This (Wild) Onion Makes Me Cry! When it recently rained for days in a row, I stood at the window and watched my weeds grow. I have quite the variety of weeds, as I suspect we all do, but some I don’t really mind. For example, Oxalis is extremely invasive, but it is somewhat pretty and is almost enjoyably easy to pull up from the soil. Even if I don’t always get all of the bulbs like I should, at least I can hold some hope that I’m weakening the bulbs by pulling up the rest of the plant. Plus, Oxalis goes dormant with the summer heat. Out of sight, out of mind, right? But my least favorite? 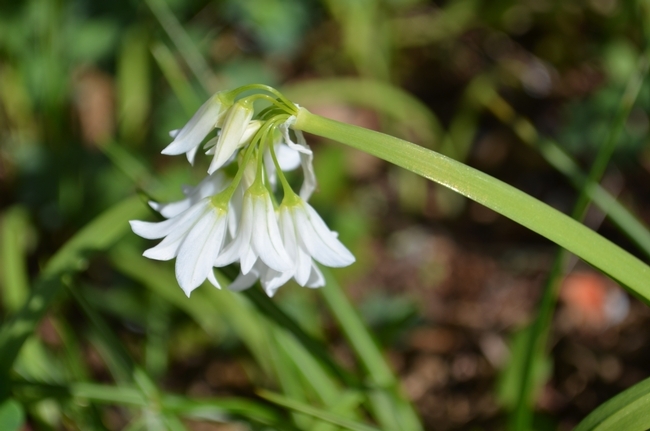 The wild onion, Allium triquetrum, which is also known as the three-cornered leek. It’s not an ugly weed—in fact, it is sometimes cultivated as an ornamental. 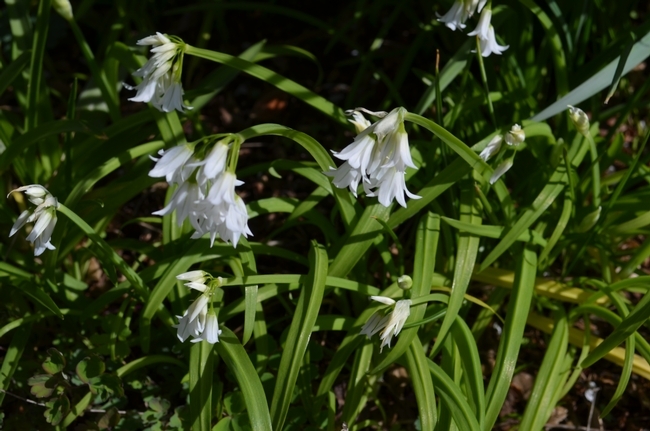 It has flower stems of about 1 foot tall, with nodding clusters of small, bell-shaped, white flowers. Not surprisingly, it has a strong onion smell. The wild onion multiplies quickly, spreading by bulbs and seeds, and it is very hard to remove once established. Like Oxalis, it can be controlled by digging up the entire plant, including the bulbs. 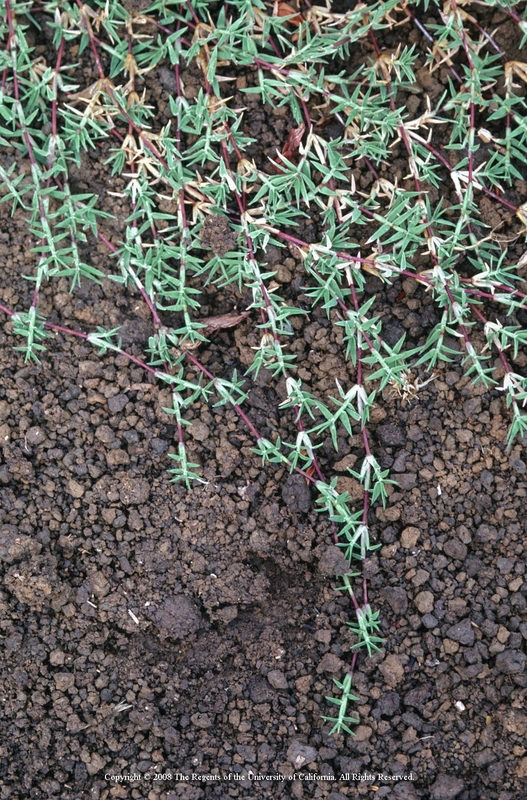 But unlike Oxalis, which pulls up easily (thus giving me a false, yet satisfying, sense of accomplishment), wild onion snaps at the soil level every time I try to pull it up. So the entire plant must be dug up, which is difficult to do given the extent of its spread throughout the yard, its proximity to other more desirable plants, and the depth to which I must to dig. And I think that’s what I find so aggravating about the wild onion. I could quit work and dig wild onions for the rest of my days, but I’m still fairly sure that I will not prevail. It spreads so quickly and so thoroughly! So at best, I try to content myself with digging a few plants and snapping off the flower stalks so that the plants don’t spread even more via seed. I know there are worse weeds, but this wild onion is the one onion that makes me want to cry. Note the cluster of white onion plants.